Many students struggle with the basic question words even when they are at pre-intermediate level. That is why I have come up with the following post. 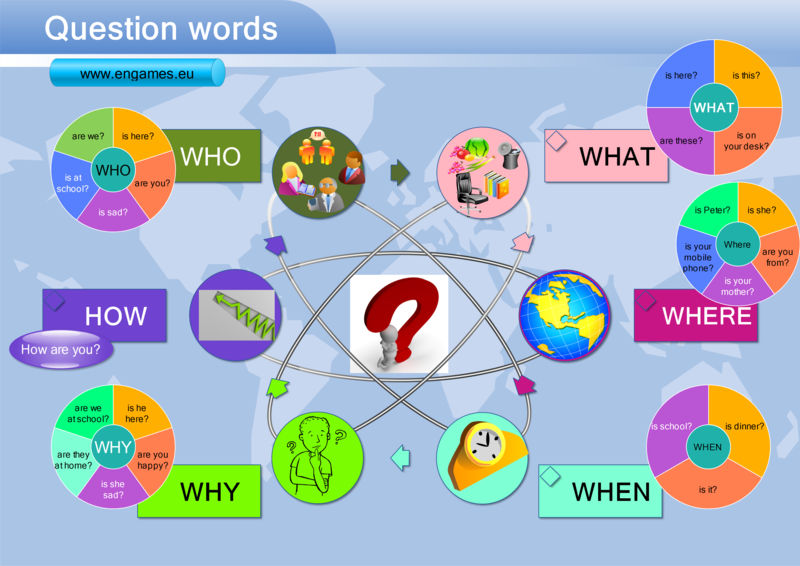 There is a mind map explaining the meaning of the question words with examples. Then there are two quizzes to practise the question words in a real context. Study the question words and examples. I think that students should translate the question words into their mother tongue too. Both of the following quizzes will play on your mobile device, however, you will not be able to play the games in the first quiz. The games will play only on a desktop. Sorry about it. In the first quiz you should complete and create the questions. If you do it well you will get a chance to play several games. The first game is called visual memory and you have to remember all the coloured squares. Can you get over the level 5? I have never managed to get that far. If you pass the second quiz you will play the game Rock, paper and scissors. It is pretty difficult to win against the computer, but it is possible. And if you pass the third quiz you can race on the tracks. The second quiz is fully in HTML5. If you pass the first quiz, you can play the game Angry finches and if you pass the second quiz you can play the game Tower Defence. You can learn some new vocabulary at our new site http://www.engames.eu. Give it a try!!! what step that is might pursue? I am very happy by your English language. teaching. I want to improve my language. please help me. I am afraid there is no post on excuses. Sorry. We will try to deal with this topic as soon as possible. Very helpful and engaging .Tqvm Mark.